Had been a general dental practitioner running a group dental practice for more than 30 years. He is actively involved in international dentistry and continuing dental education programmes. By holding the posts of Secretary General of Asia Pacific Dental Federation / Asia Pacific Regional Organisation (APDF/APRO) for more than 25 years and concurrently as Executive Director of the International College of Continuing Dental Education (ICCDE) for more than 20 years, he has been in the forefront for more knowledge and more information for general dentists and specialties. He practices general dentistry with special interest in orthodontics and dental implants. In orthodontics he undertakes a wide selection of cases and had been utilising orthodontic anchorage from teeth movement. In the field of implants he abandoned conventional dental implants and concentrated on mini dental implants for the last twelve years. 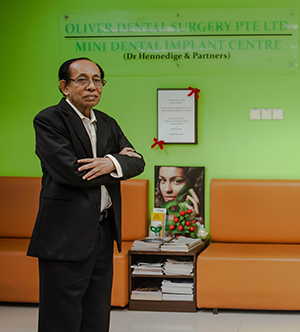 His group practice in Singapore has in the last 12 years placed more than 40,000 mini dental implants successfully in patients from stabilisation of dentures to fixed dental crowns and bridges. Australia, Bangladesh, Philippines, Singapore, Malaysia, Macau, Myanmar, Fiji, India, Sri Lanka, Pakistan, Nepal, Indonesia, USA, Saudi Arabia, and Hong Kong. For his outstanding work on mini dental implants he was made a Diplomat of the International Academy of Mini Dental Implants in USA. His interest in organised dentistry has led to his active involvement in the Asia Pacific Dental Federation and the World Dental Federation (FDI). He contributed significantly to the progress of dentistry and continuing dental education in the Asia Pacific region.